My husband Paul and I first traveled to Costa Rica’s Central Valley in 2008 with the intention of discovering whether or not we might want to retire there. We visited big towns and small towns, looked at apartments, condos, and houses…some very basic and some built to U.S. standards. Over the next year, we met folks who had already made the decision to retire in Costa Rica, to find out what they liked, what they missed, and what they wished they would have done. In all of our research, both on-the-ground and online, one town kept coming to the forefront for us…San Ramon de Alajuela. 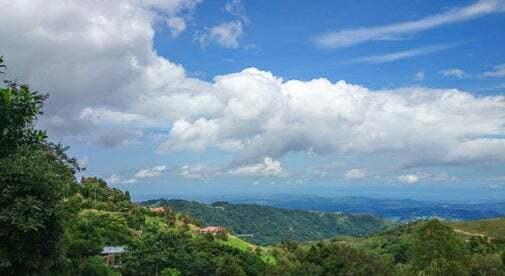 Also known as the “City of Poets and Presidents,” San Ramon has been home to many of Costa Rica’s great political and literary figures, including former President Jose Figueres Ferrer, who abolished the country’s army and granted women the right to vote. This was one of our top reasons for choosing San Ramon. Education and culture is important here. The University of Costa Rica has a campus and small branches of other universities are scattered about town. Because we have these universities, we have more cultural activities. We are regular visitors at both the Jose Figuerres Cultural Center for concerts, art exhibits, plays, and local cultural fests, and the Museo de San Ramon, run by the University of Costa Rica. The traditions and customs are unchanged from years ago in this coffee town. The culture is still intact. Sure, there are expats, but not too many. We can practice our Spanish, do errands, and maybe meet some great Ticos along the way. That’s exactly what we were looking for. San Ramon is only 45 minutes from the international airport outside of the country’s capital of San Jose. It is only about 50 minutes from the best public hospital in the country, Hospital Mexico, and one hour from several excellent private hospitals in San Jose. And in just 45 minutes, we can be at the beach. Playa Doña Ana is the closest beach and has shade trees, picnic tables with barbecue grills, bathrooms, showers, and changing areas. It’s a real Tico family beach, there are no souvenir shops or expensive restaurants. Its natural beauty is its strength. Living in San Ramon, we save about $300 per month on our gas and electric bill compared to when we lived in the U.S. We are able to leave our door and windows wide open most days, allowing us to “live outside” like we never could back in Baltimore. If we’re cold, we put on sweatshirts; if we’re hot, we put on shorts. And no more shoveling snow like we had to do in Maryland. Whether you are interested in education—teaching English, art, or computer skills—animal rescue, helping at the library, fund raising, the environment, Red Cross, or playing with the kids at an orphanage, there’s something for you in San Ramon. We have never regretted our move to San Ramon. It has become home to us in so many ways. In our hearts, we are now moncheños (people from San Ramon).